It all started with the Nutritional Labeling and Educational Act (NLEA), and it was wonderful for consumers who wanted to know about the nutrients in the foods and beverages they purchase. That was the year the Nutritional Facts Label became a required addition to the information made available on the packaging of food. The FDA has extensive rules outlined at its Food Labeling and Nutrition Overview web site. You should visit the site - nutritional information appears simple as you look at food packaging, but there is a great deal of work that goes into the labeling and ingredient statement. Manufacturers of packaged foods and beverage were also greatly affected by the introduction of 'Nutrition Facts.' It became important to minimize undesirable nutrients and maximize and highlight desirable nutrients. Some nutrients are known as 'nutrients of concern.' Health authorities want us to consume less of these. They are fats, especially trans fat, and to a lesser extent total and saturated fat. Also sugars, sodium, and to a lesser extent, cholesterol. Though not classified as a nutrient, calories are also of great concern. There are also 'nutrients to encourage.' Among them are fiber, protein, vitamins A and C, and the minerals iron and calcium. A product's recipe has the most influence on the nutritional properties and the second most influential factor is the serving size. Almost everyone wants to use a smaller size to reduce those 'nutrients of concern.' However, there are federal regulations about serving size for most categories of foods and beverages. When designing food & beverage packaging, many food entrepreneurs overlook the importance of proper Nutrition Facts Label design and its importance in getting your product off the shelf. Several months ago I was asked to prepare the Nutritional Facts Label for a new product launch of a single serving chocolate cupcake with chocolate icing. It had lots of butter and chocolate and could be described as big, decadent, luscious - cupcakes are viewed as an affordable indulgence. It was a recipe for a new product launch failure. Abington Nutrition Services performed extensive "surgery" and reformulation. The cupcake was reduced in weight from 5 to 3.5 ounces, and the very generous portion of icing was cut by almost half. The icing was overwhelming the cake. The cupcake contained a commercial leavening preparation which was high in sodium, which is typical of leavening. Also, baking soda (sodium bicarbonate) was also in the formulation. By removing the baking soda the final texture was almost the same, the flavor was better, and the amount of sodium was reduced. The new product development reformulation of the chocolate cupcake had 480 calories, 33 percent of the daily allowance for saturated fat, and 15 percent of the maximum acceptable daily intake for sodium. The reformulation created a new cupcake still had a visually impressive appearance. The smaller size had a new selling price was much more competitive with other single serving desserts - a deal breaker when pitching to the retail buyer is being outside of the competitive price points for your product category. As this example illustrates, the introduction of the Nutrition Facts Panel has made targeting the nutritional values an essential aspect in developing and marketing a new food or beverage product. There are nutrition facts software packages for purchase, but there are many free online tools available to make estimates of the nutritional content based on a product's recipe. A valuable site is www.nutritiondata.com. 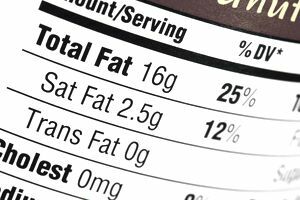 Nutritional Facts Labels are an important part of your food & beverage packaging and critical in 2 areas. Consumers - Consumers trust that the nutrition facts panel is accurate; consumers use this information when making their food and beverage selections. Trust is part of brand imaging, and this is not the area to scrimp; once you lose consumer trust is almost impossible to recapture it. Regulatory Agencies - both state and federal occasionally select random foods products from the retail supermarket shelves and analyze them for accurate nutritional labeling. These same authorities also respond to consumer complaints about nutrition labeling and will use your nutrition facts panel in the investigation. Once a final recipe has been approved it is best to have a professional prepare the Nutrition Facts Panel, create a compliant ingredient list and declare any allergens that may exist. They can handle sending all of this information directly to your packaging designer or packaging supplier. Richard Perlmutter is founder of Abington Nutrition Services LLC, Elizabeth, NJ. He is a member of the American Dietetic Association, the nation's largest organization of nutrition professionals. He may be reached at richard@abingtonns.com.